A quick bento made with leftover camping goodies. I made an apple shaped sandwich (with bologna and cheese), cucumber slices, carrots, and chive blossoms. 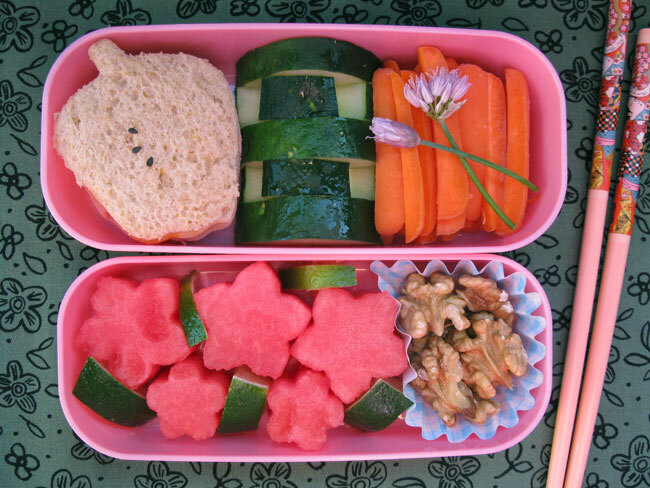 In the lower compartment: watermelon slices (cut with my new bento food cutters! I super love these, and just got them from Amazon), slices of lime to squirt on the watermelon, and a few walnut halves. The larger set of food cutters can be found here: Stainless Vegetable Cutter, Large, 6 Assorted Shapes , and the smaller set of food cutters can be found here: Stainless Steel Vegetable Cutters #K8444 "100% Made in Japan!!" My coworker Danielle brought in some watermelon slices yesterday, and I also ended up seeing a gorgeous photo of watermelon chunks online with an amazing recipe for tequila soaked watermelon wedges. The watermelon slices in this bento are booze free! All of the watermelon stuff seeped into my brain and I couldn't get away from it. But do I recommend checking out this recipe. I tried it out on myself and my hubby last night and it turned out great! With the 90+ degree weather we've been having recently, this stuff is amazing. Oh, and the recipe on this page recommends boiling the alcohol in the simple syrup, but you should make the syrup first, then add the alcohol when it cools. I love the watermelon in your bento box, it really stands out. Cute apple too, how many cutter did you get? Hi Lyndsey! Thanks for the compliment! The apple cookie cutter was from Sur la Table, and the flower shapped cutters are ones I picked up on Amazon.com. I added the links to the flower cutters to the post.